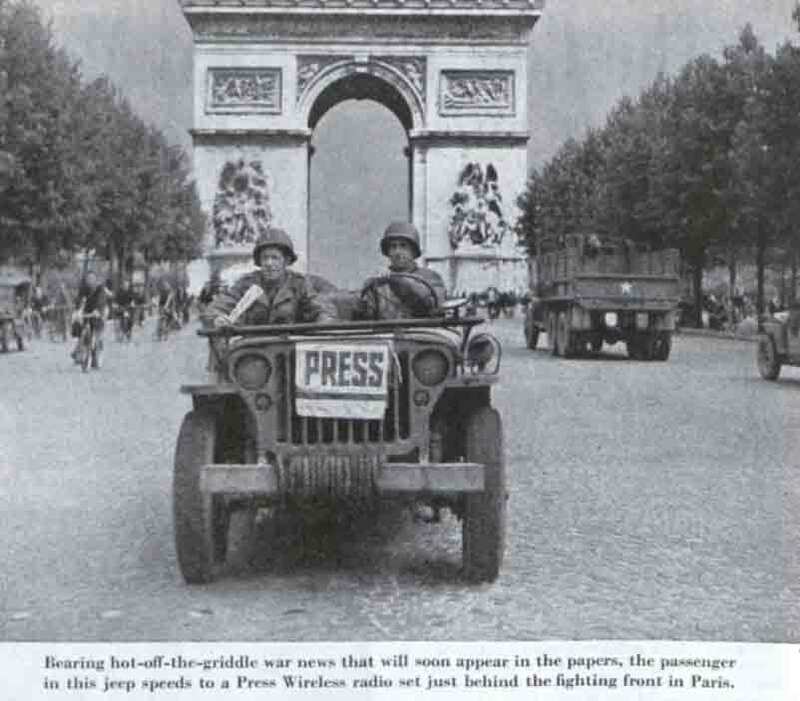 This photo was published in the October 21, 1944, issue of the Saturday Evening Post. 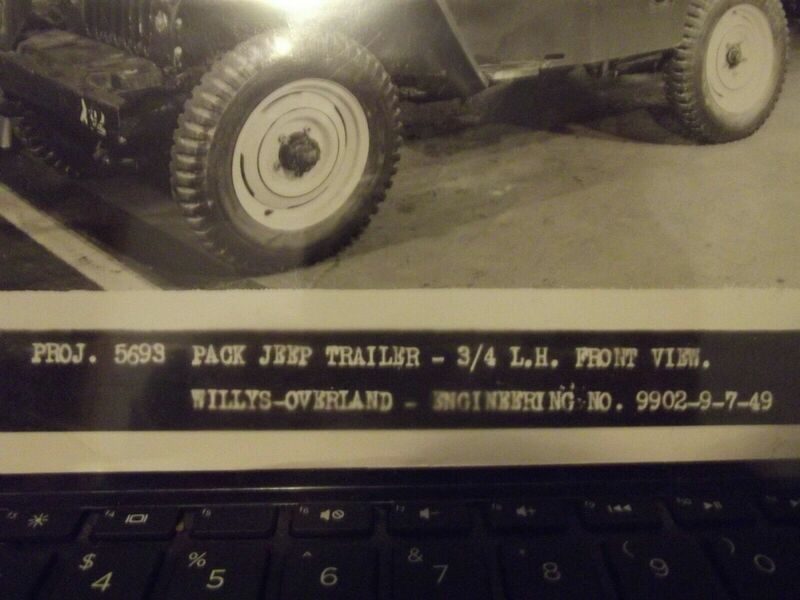 UPDATE: The caption and date are slightly different between this current pic on eBay and its predecessor from 2013 (at bottom). This version of the photo was auctioned in 2013 on eBay. 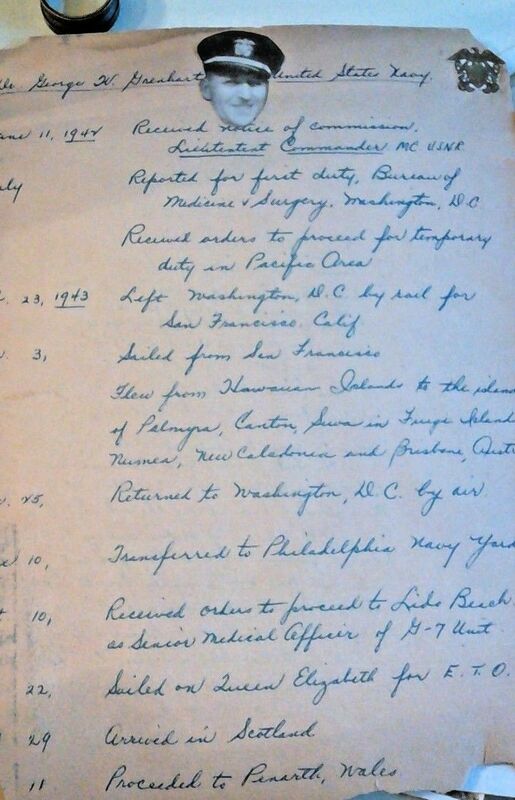 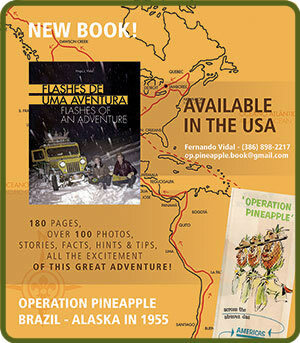 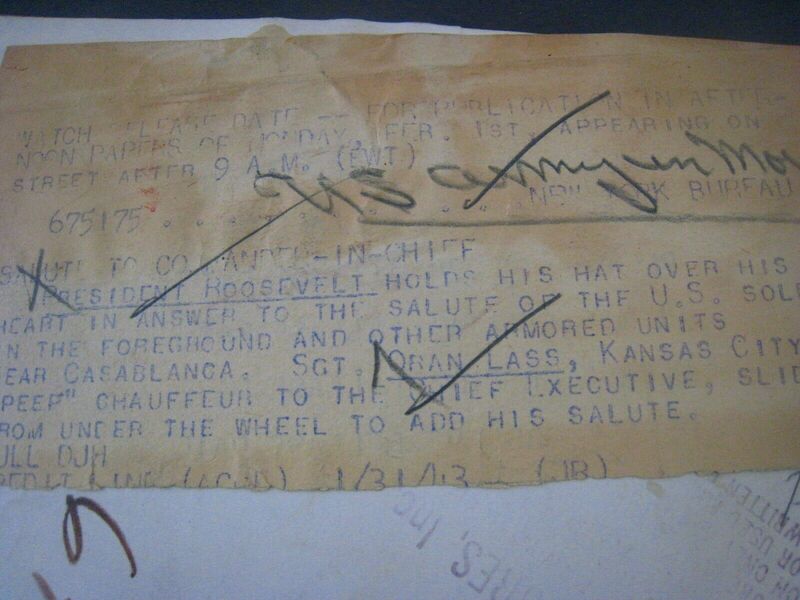 It has the date of March 13, 1942. 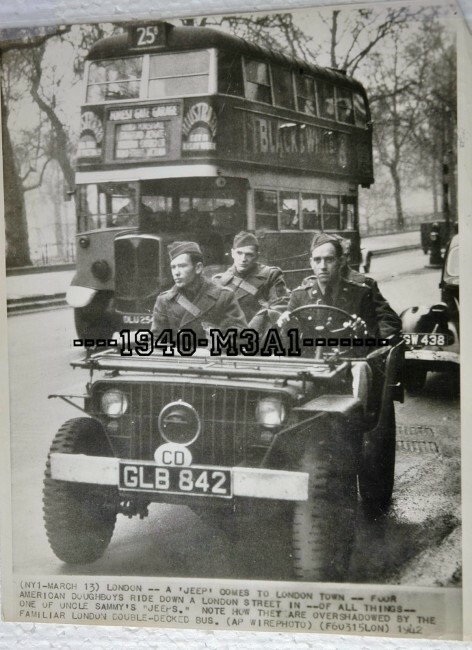 The caption includes the verbiage, “A ‘Jeep’ comes to London Town”. 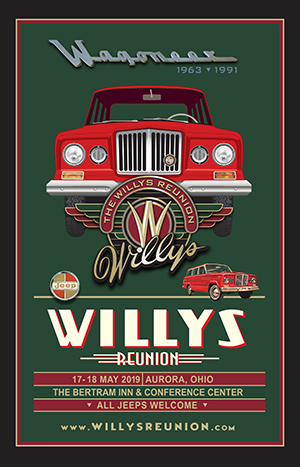 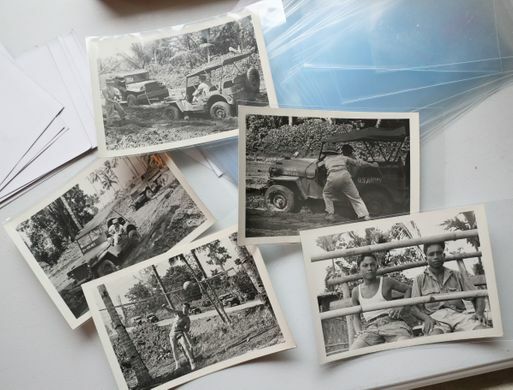 Allan shared the news that Jake Skoric, a photographer with who took photos before during (in the South Pacific) and after WWII will have his photos being sold over the next three days. As you can see in the preview photos here, there are thousands of photos being sold. 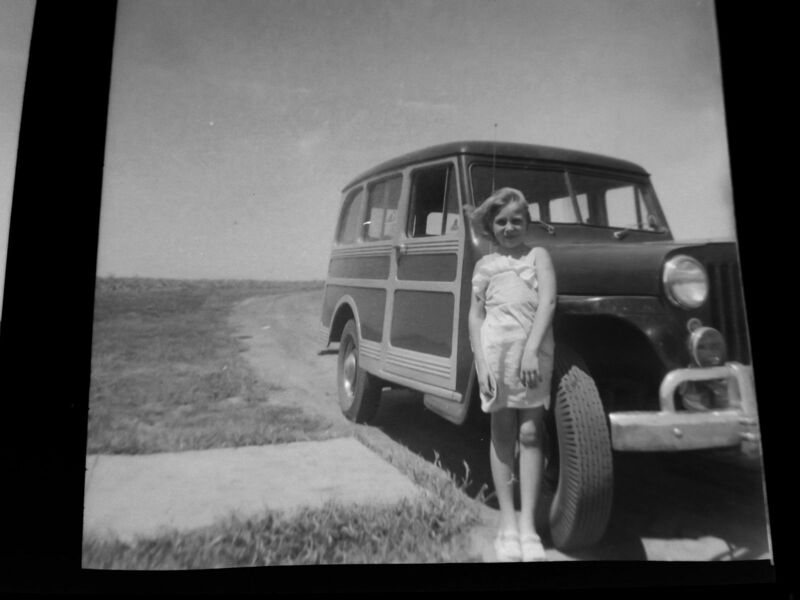 April 11, 2019 • CATEGORIES: Features, Old Images • TAGS: Lengthened, Odd Body. This MB has been lengthened. There’s something about these two photos I find simultaneously hypnotic and eerie (maybe ghostly?). 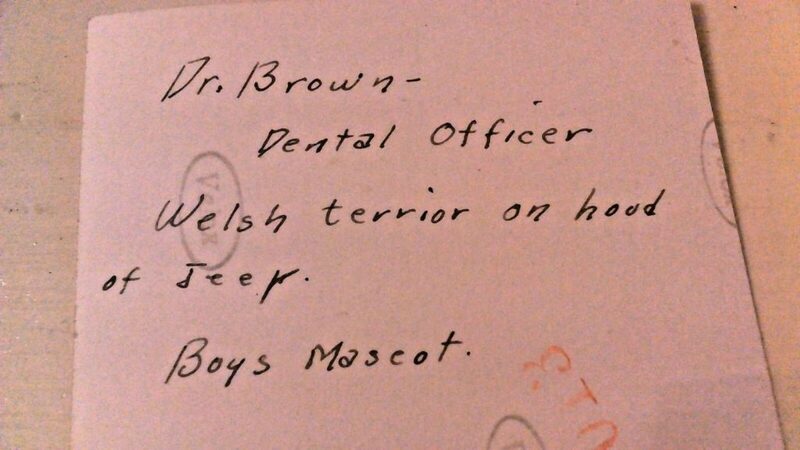 I can’t quite figure out why that is. 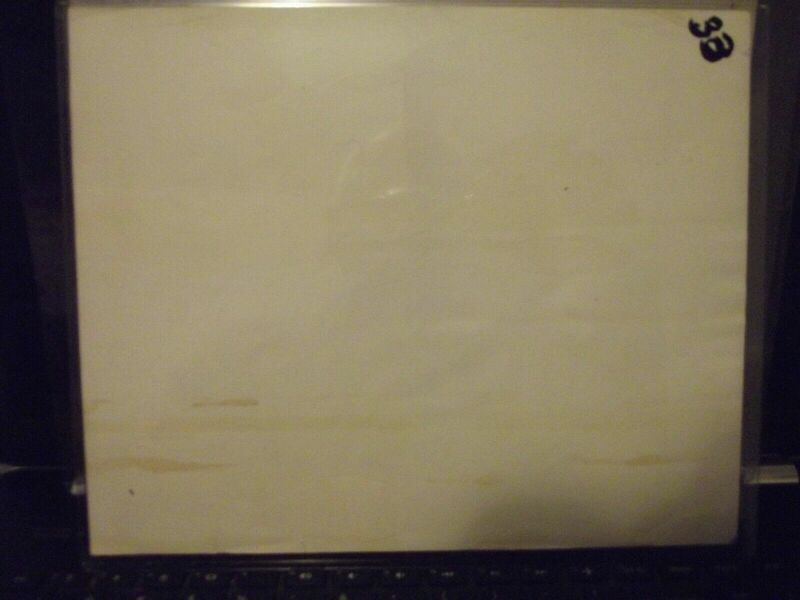 I can feel the wind blowing in them. With all those people around, why not try to pick it up and out of the hole? 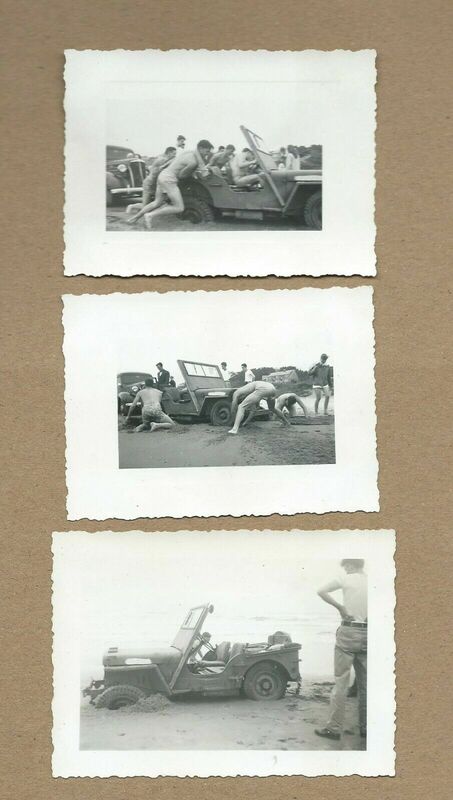 These may have been taken on the Oregon Coast. 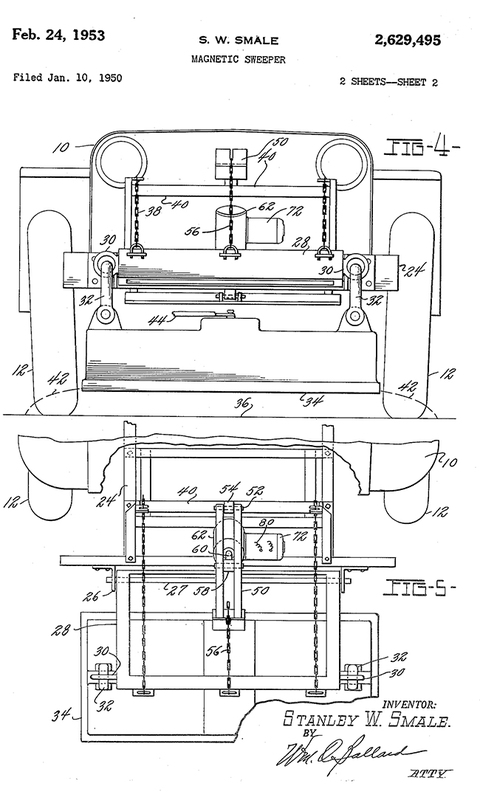 This photo was published in the February 09, 1945, issue of the Saturday Evening Post, page 12. 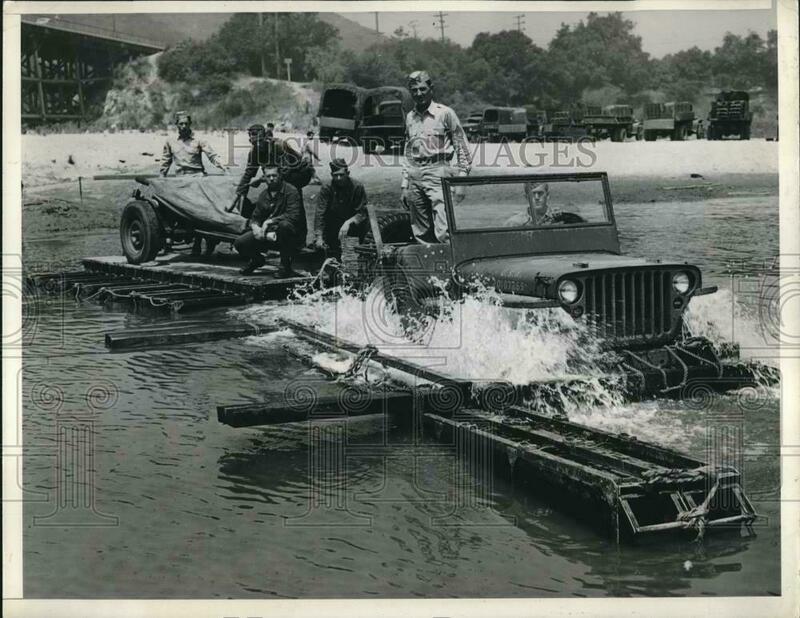 It shows a Weasel getting a muddy test with a jeep next to it. 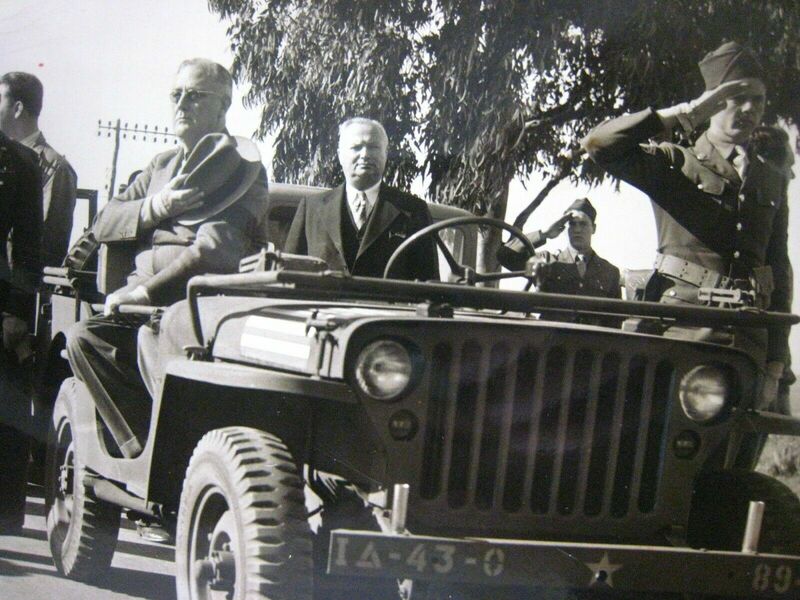 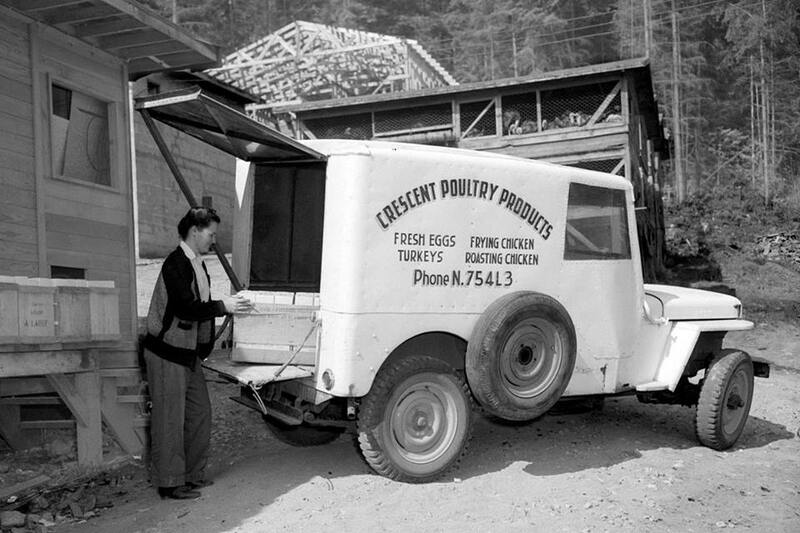 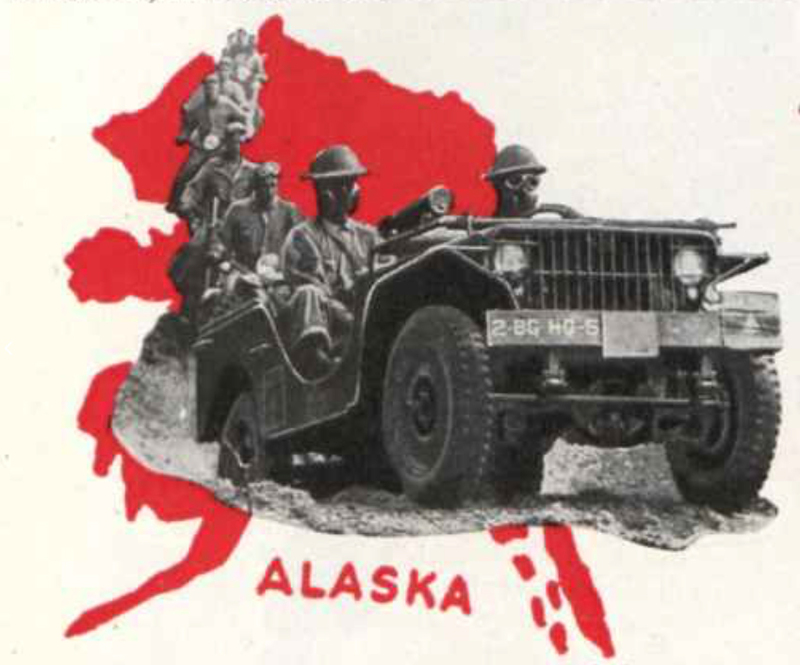 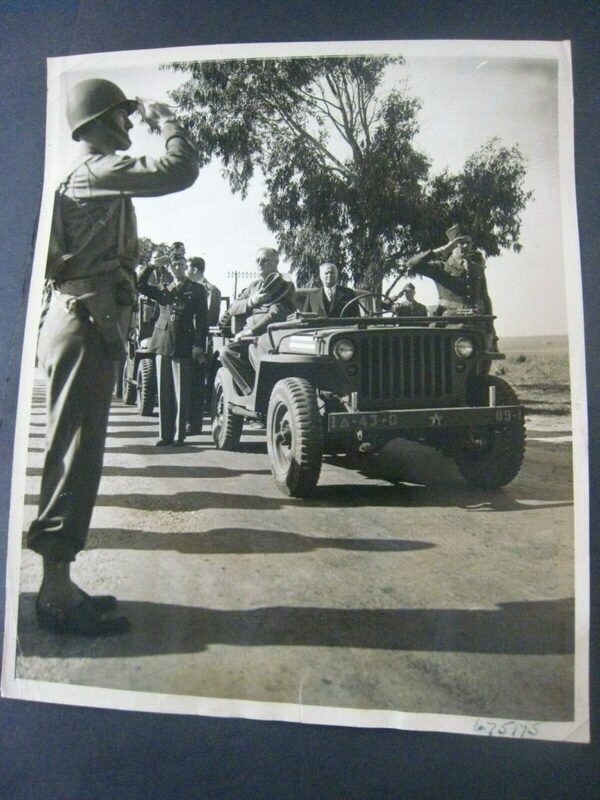 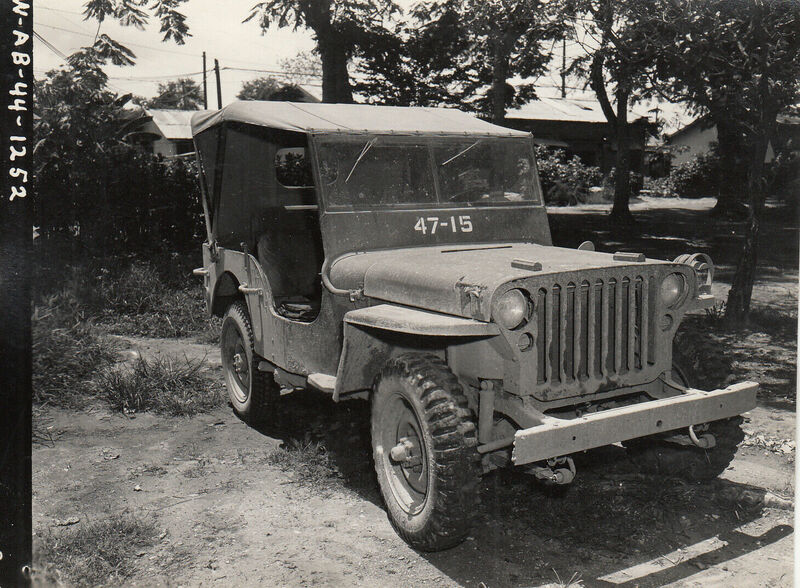 Note the modified side entrance of this jeep on the February 2, 1943, photo of President Roosevelt. 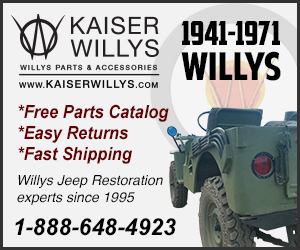 A nurse was wounded in this jeep on Saipan in 1944. 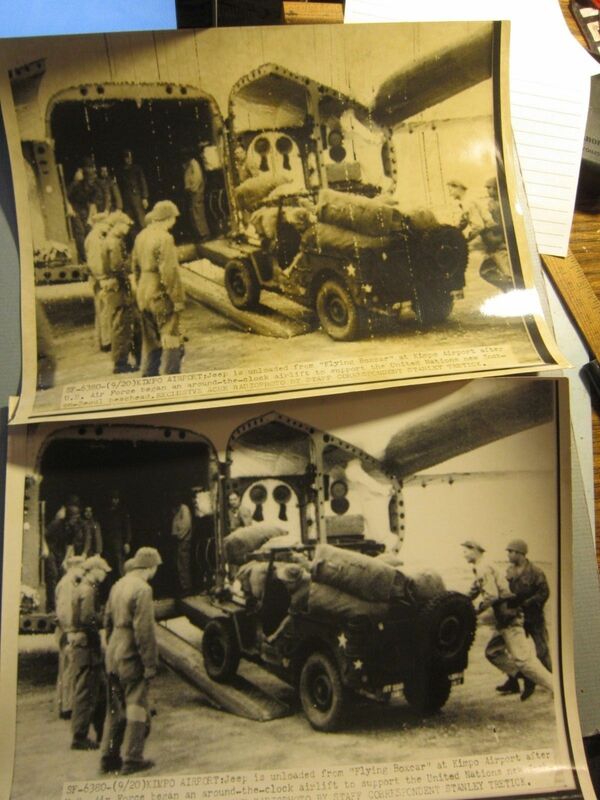 QUANTITY: 1 – See the other original WWI & WWII photos that I have listed. 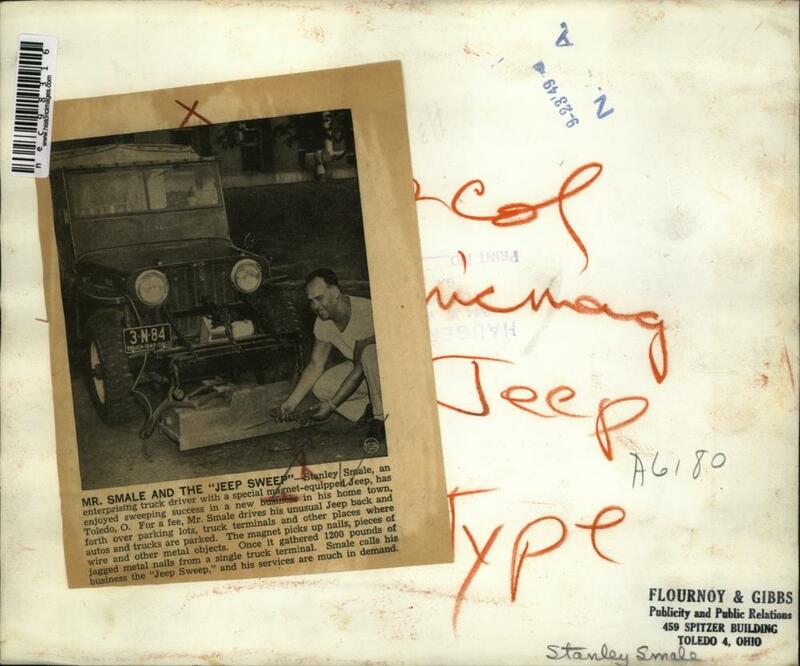 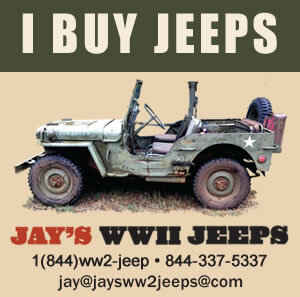 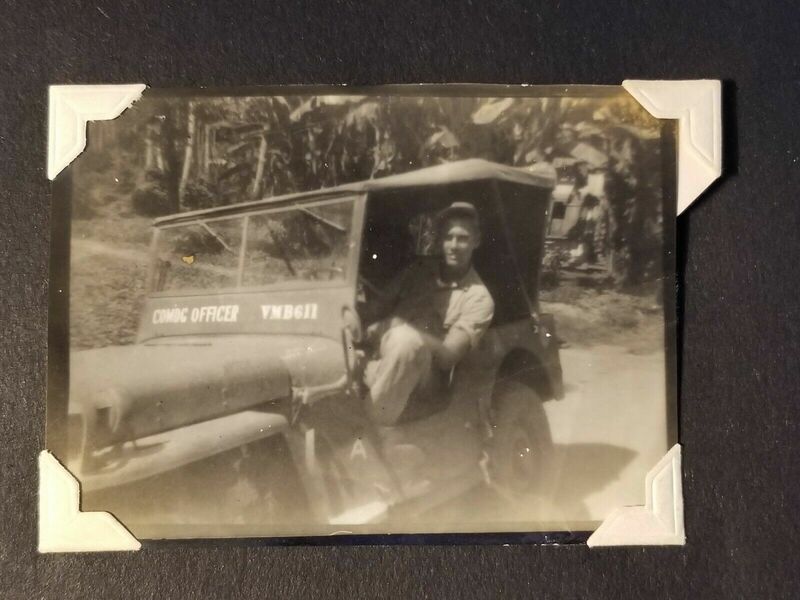 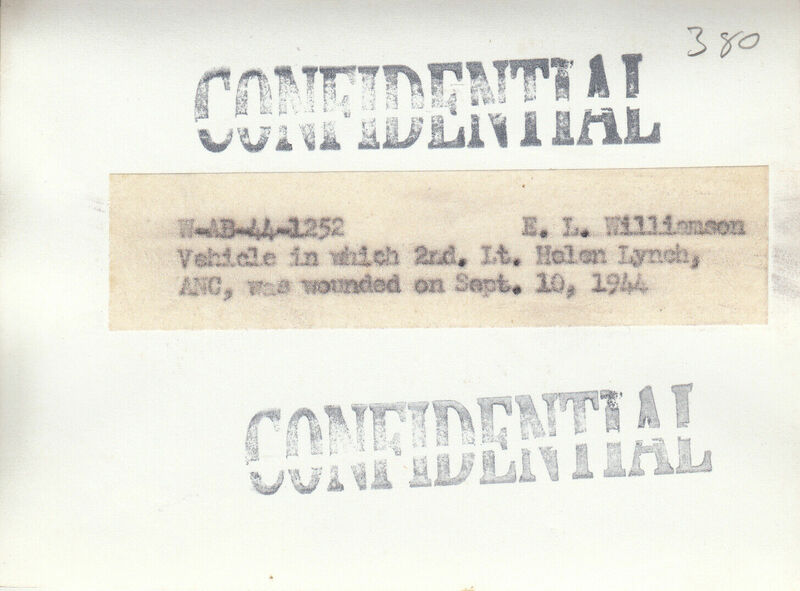 ITEM: Original WWII CONFIDENTIAL photo of Jeep that US Army Nurse 2nd Lt. Helen Lynch was wounded in on Saipan, 1944. Part of a large group of original PTO photos that I am listing. 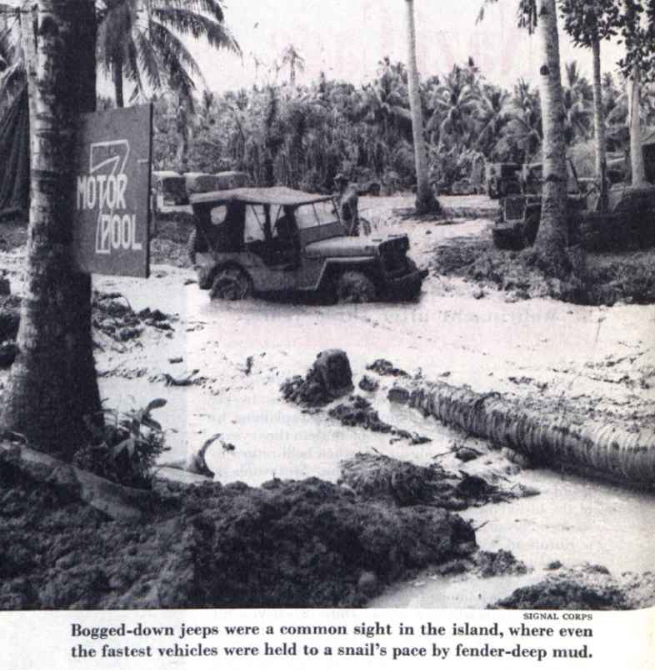 Most are of the Invasion and Occupation of Saipan and a few are of Tinian. 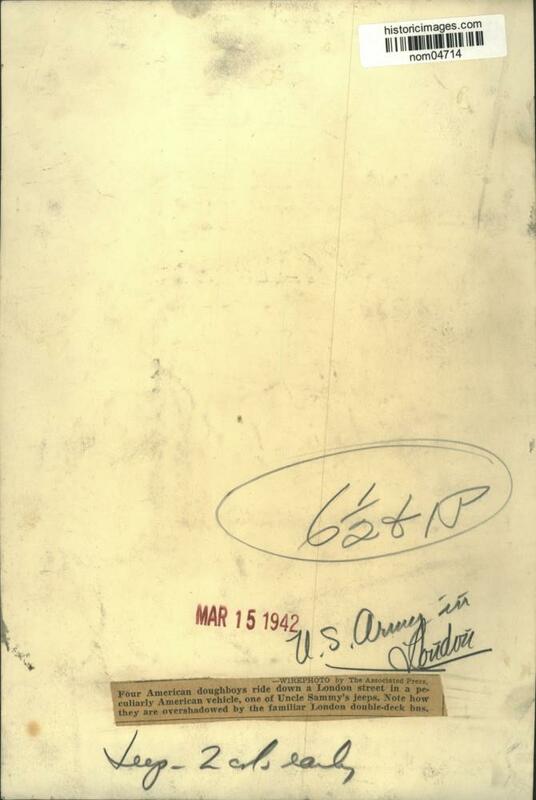 DATE: 1944 – photo does not glow under a black light. 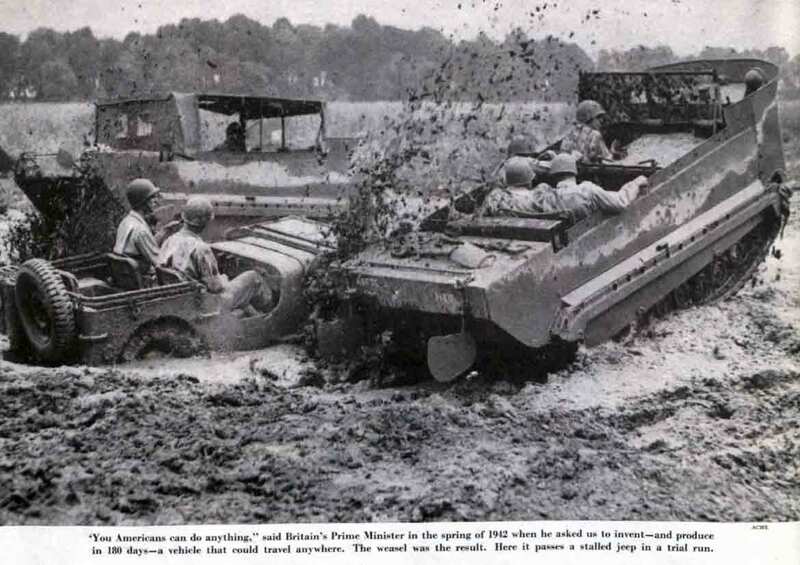 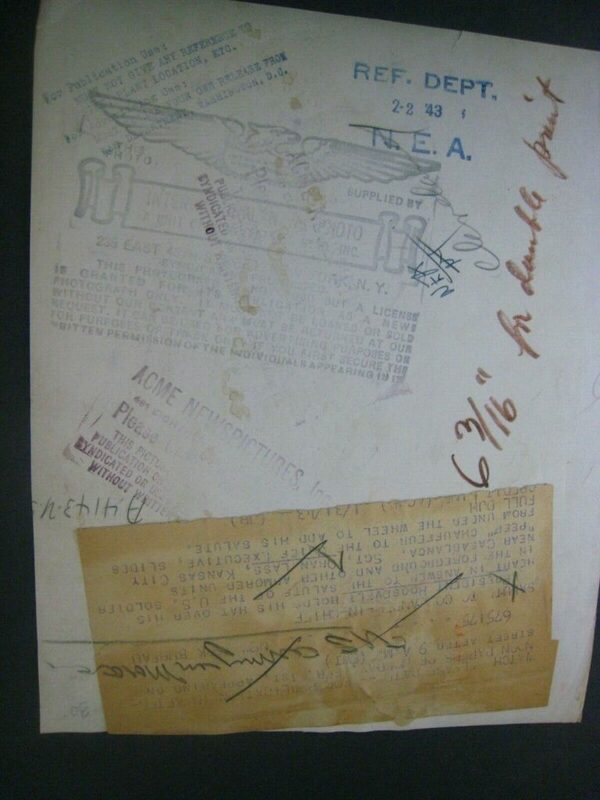 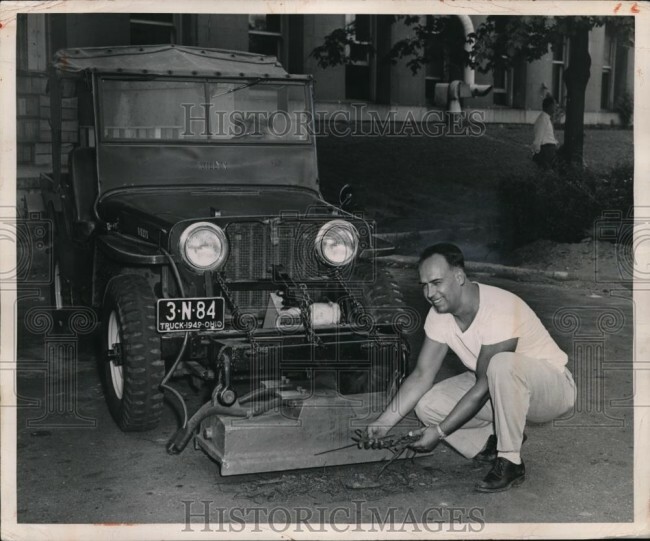 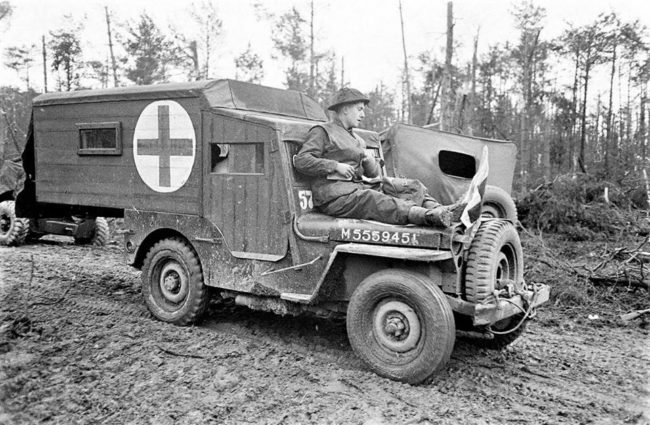 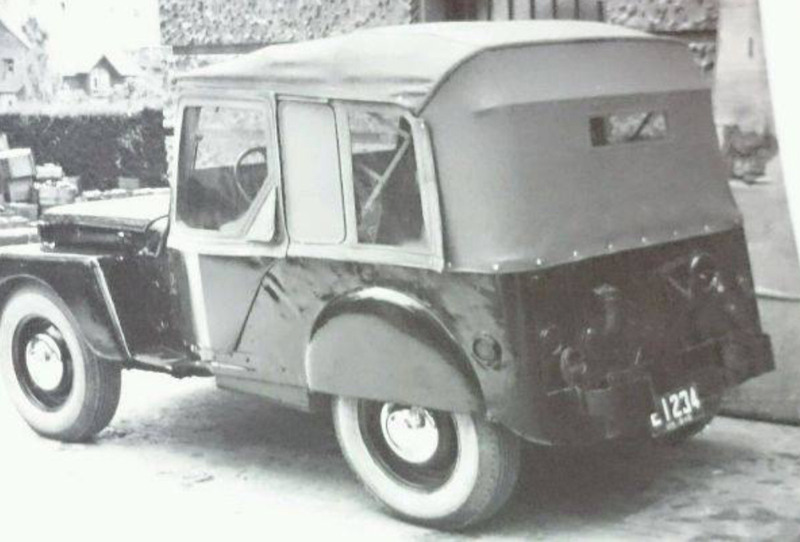 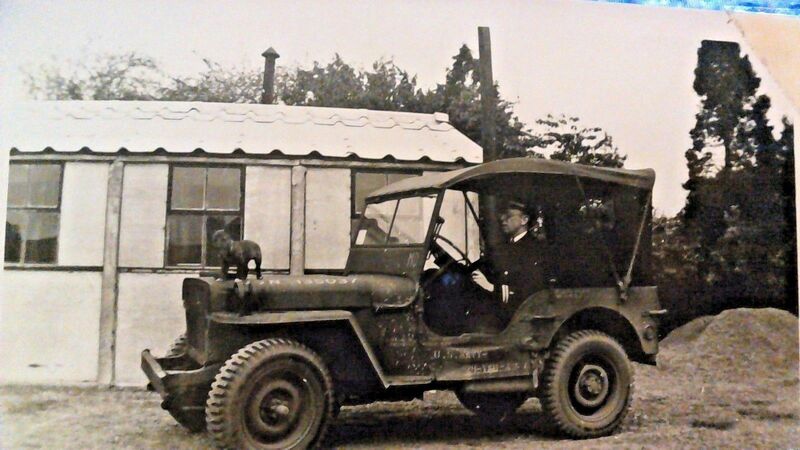 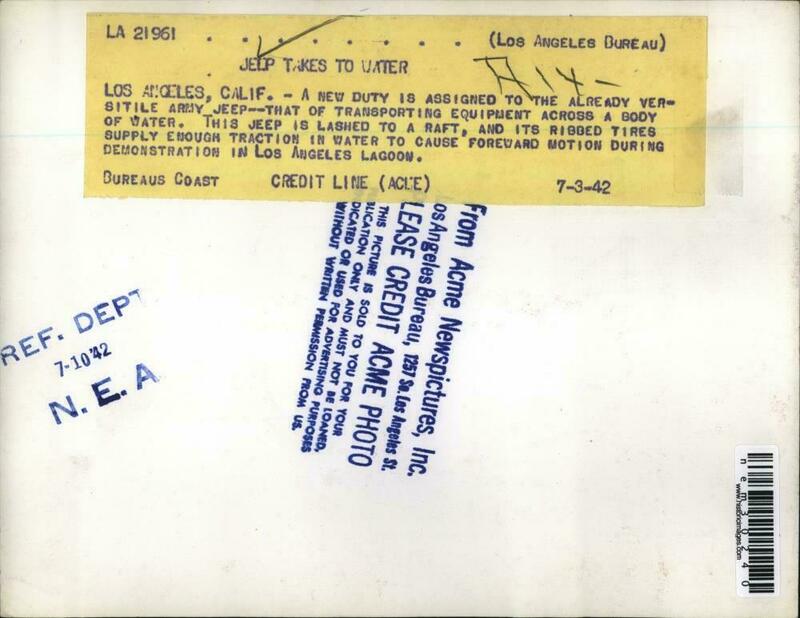 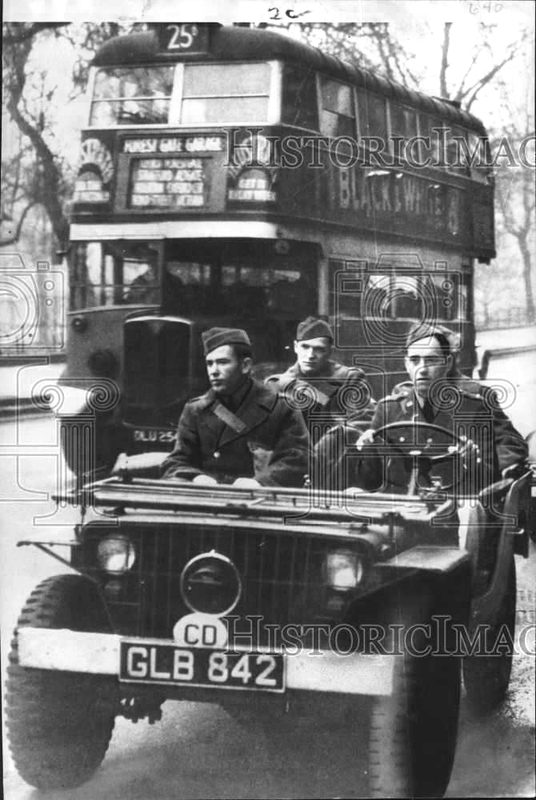 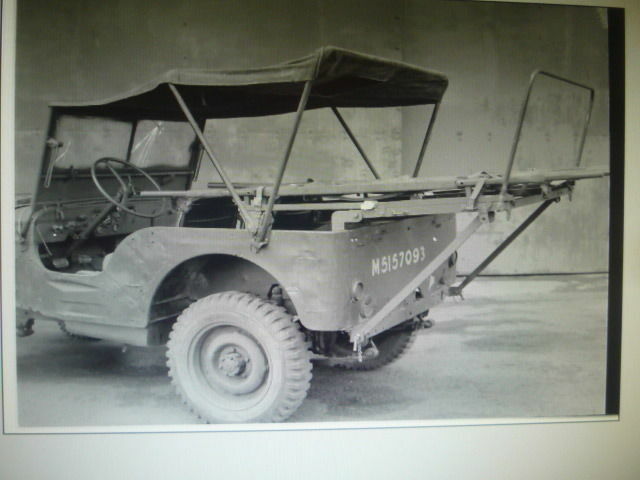 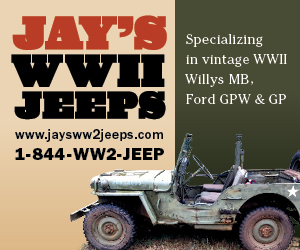 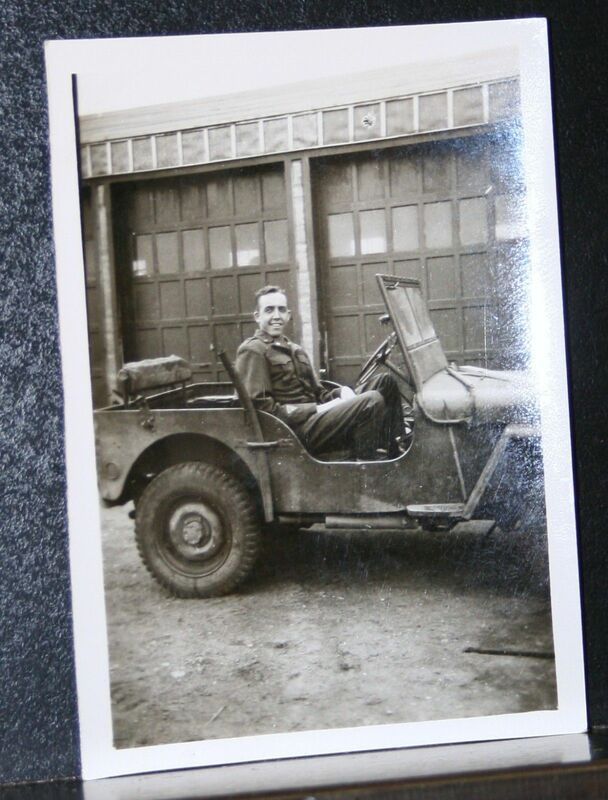 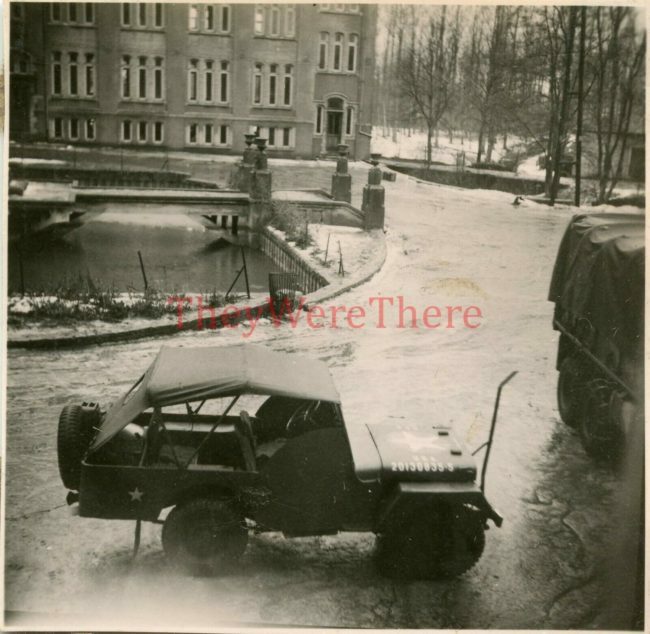 CONDITION: Very Good; See scans..
British Airborne jeep with littler attached. 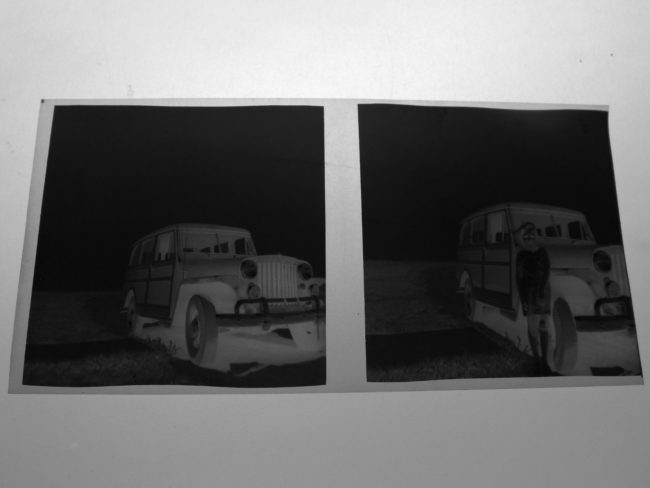 This is a negative. 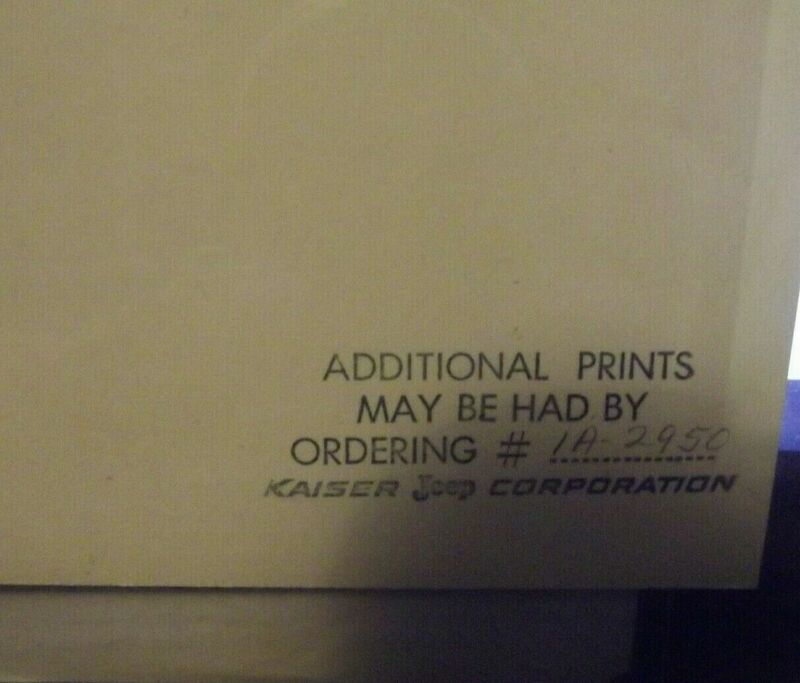 Seller has other, similar negatives. 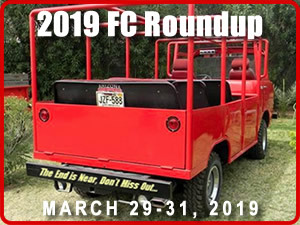 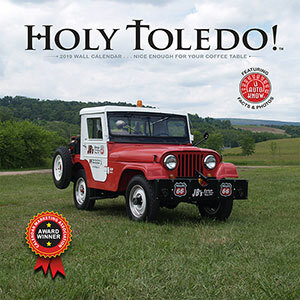 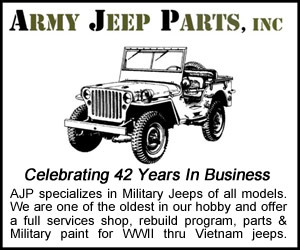 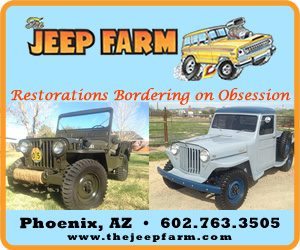 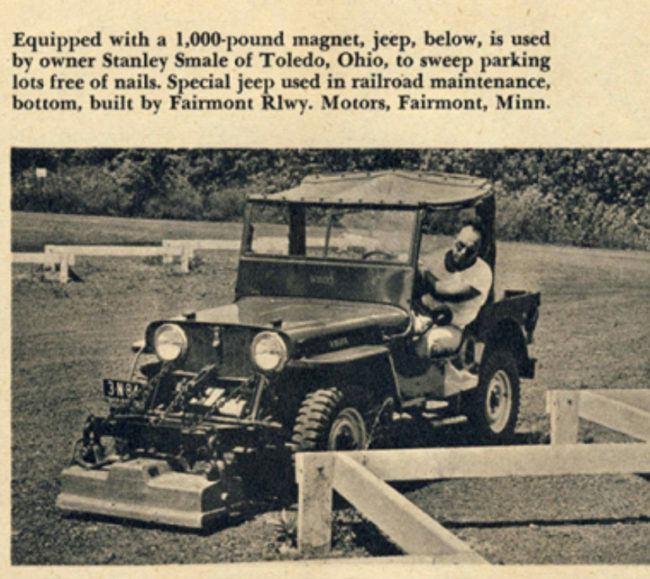 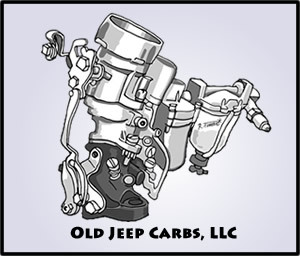 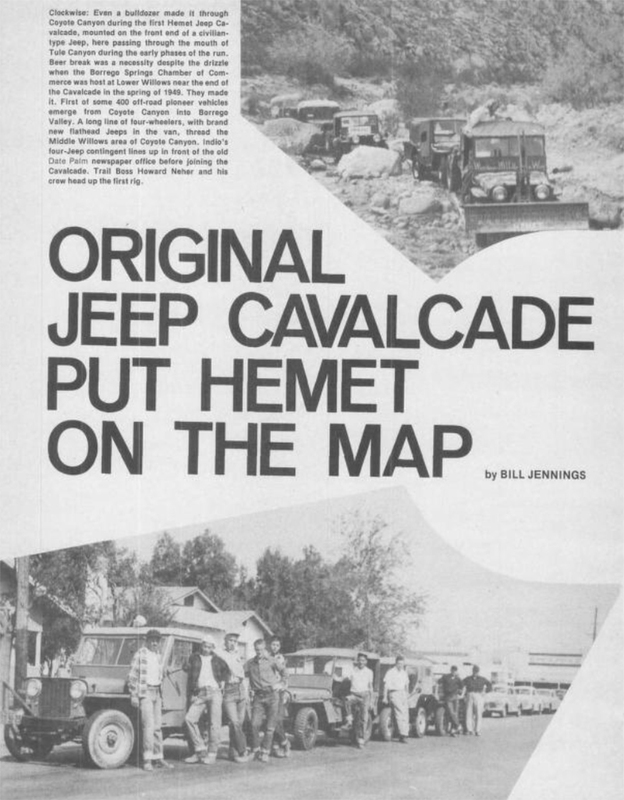 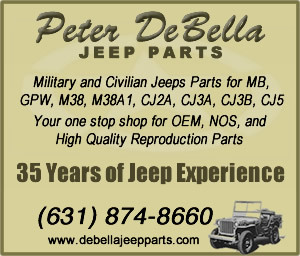 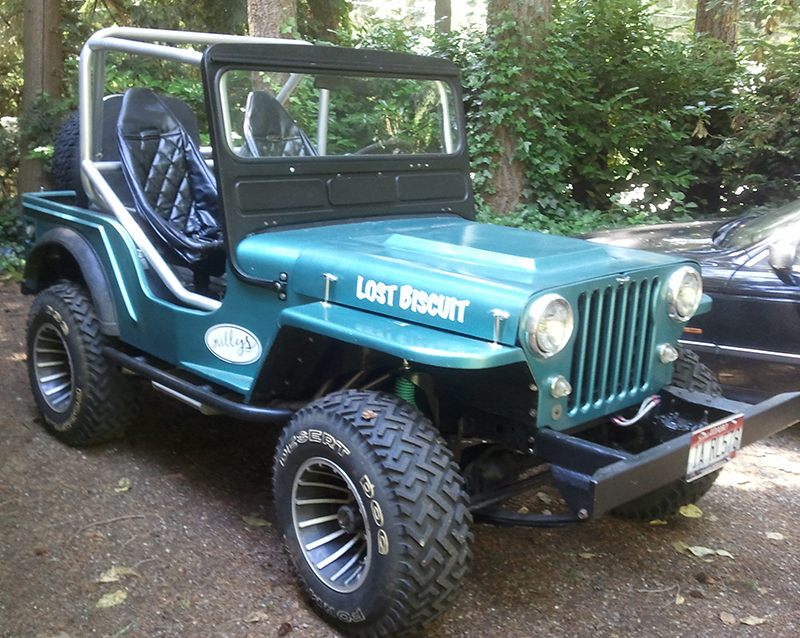 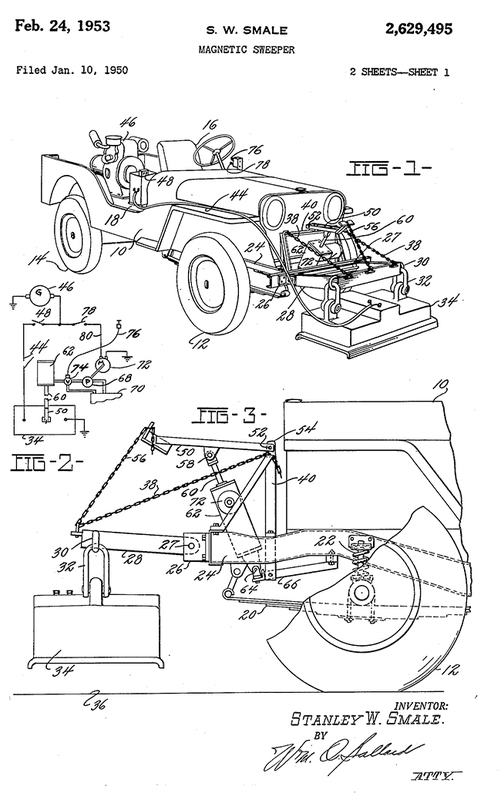 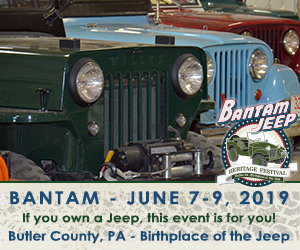 I’m guessing this photo was part of the 1955 CJ-5 introduction? 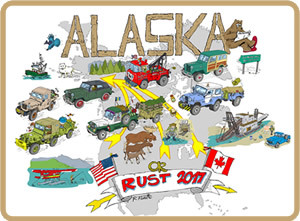 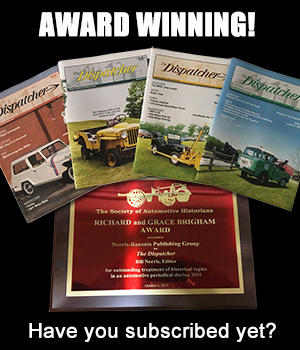 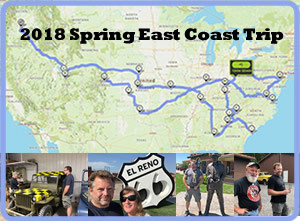 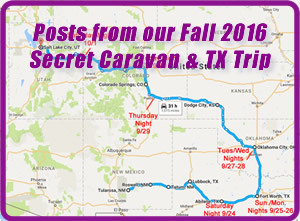 Is that a truck-bed trailer? 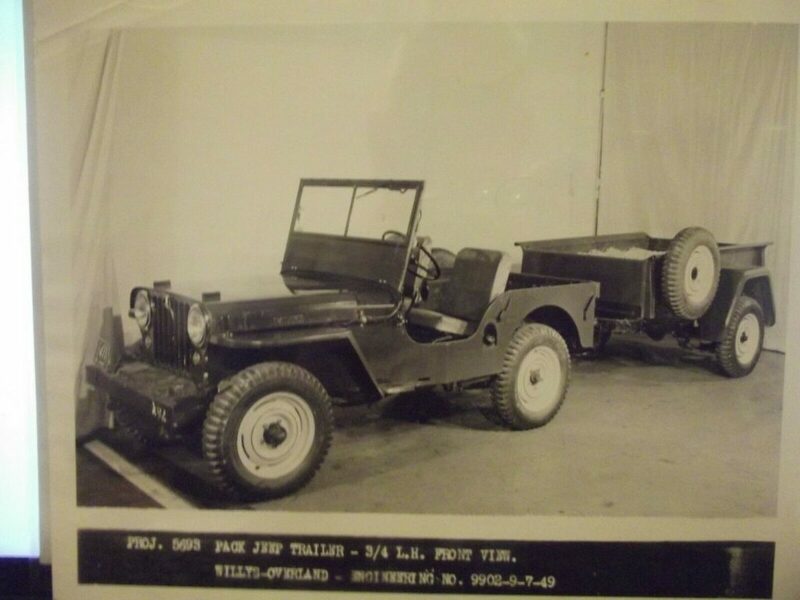 The price on these two identical photos is good. 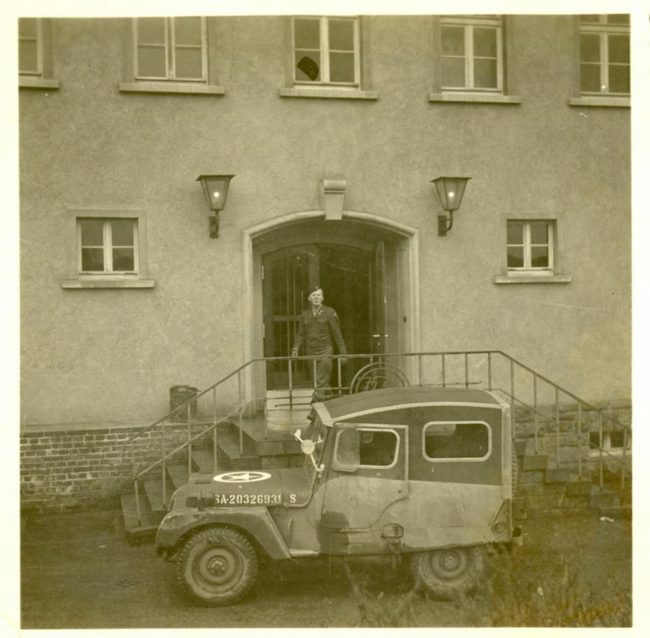 The photo appears to have been taken on September 20, 1950. 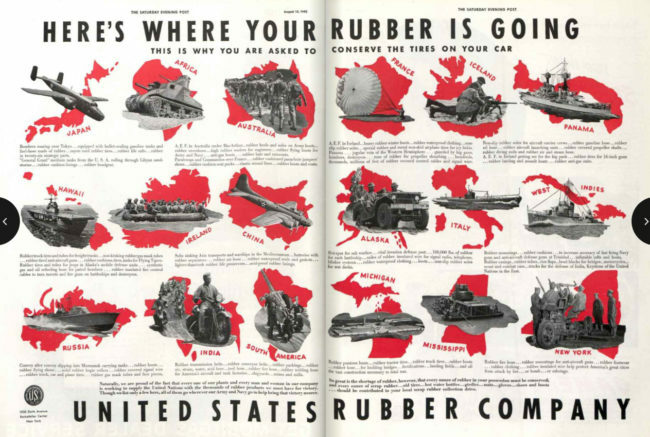 On pages 48-29 of the August 15, 1942, Saturday Evening post featured an ad by the United State Rubber Company titled “Here’s Where Your Rubber is Going”. 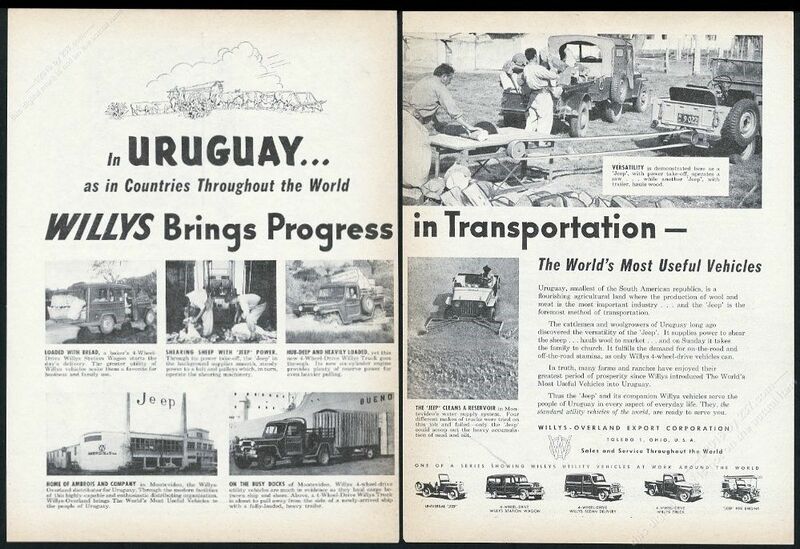 The ad included a Ford GP. 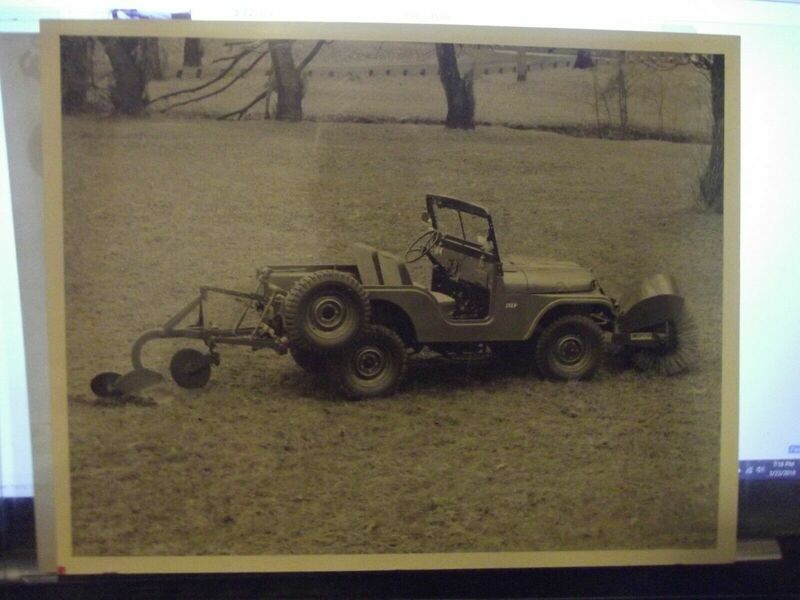 Farrell Fox shared this photo of what I call a “Sedan-Jeep” on Facebook. There was no year or caption. 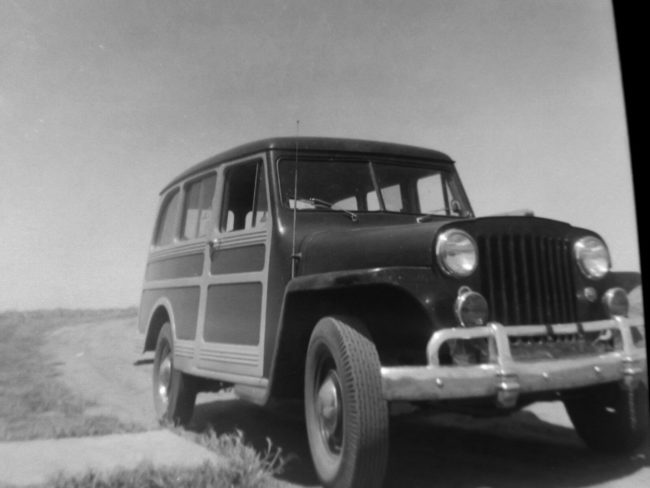 I loosely define a sedan-jeep as one which has had some kind of custom top and/or fenders, added that make the jeep a little more car-like. 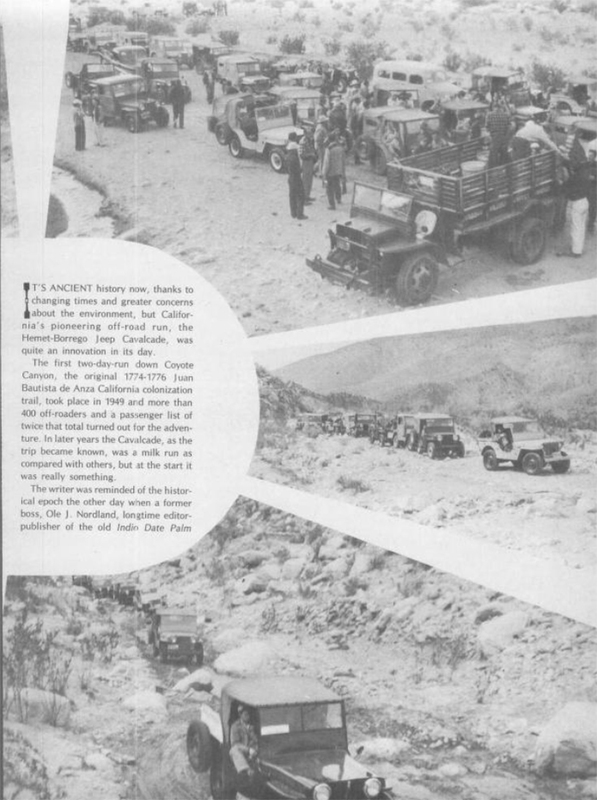 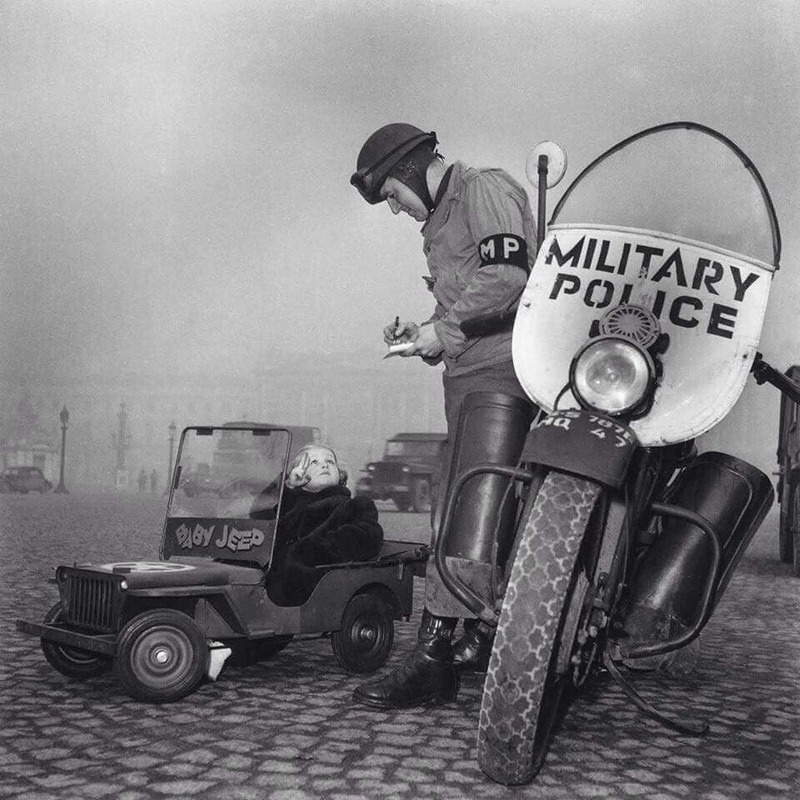 This photo appeared in the February 03, 1945, issue of the Saturday evening Post, page 18. 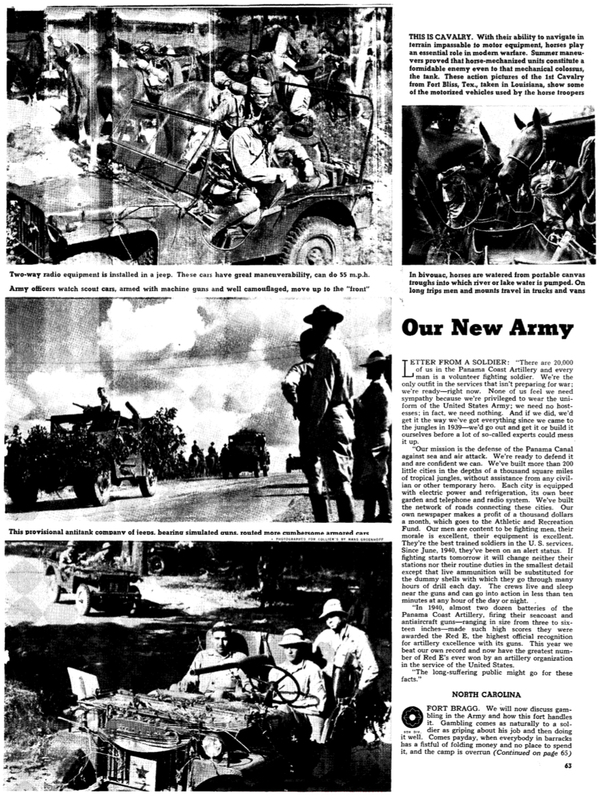 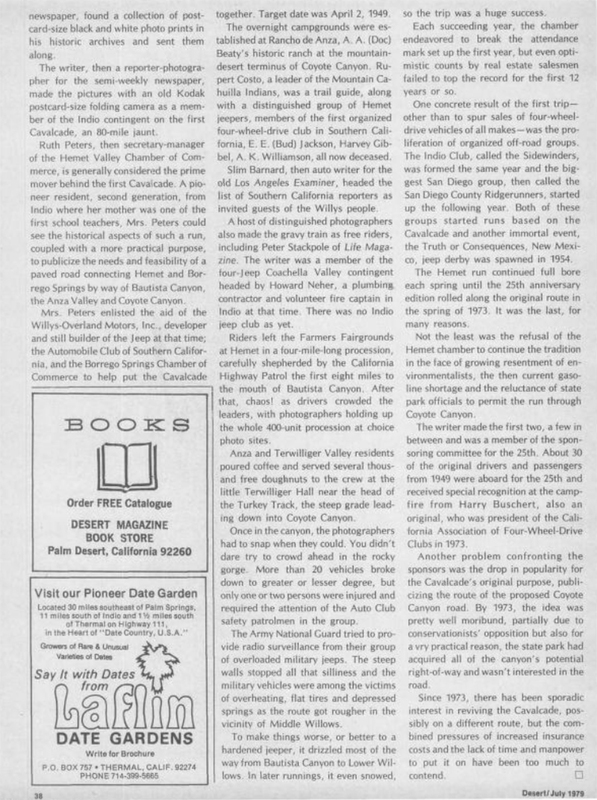 This article was published on June 29, 1944, in the Sotoyome Scimitar newspaper out of Healdsburg, California. 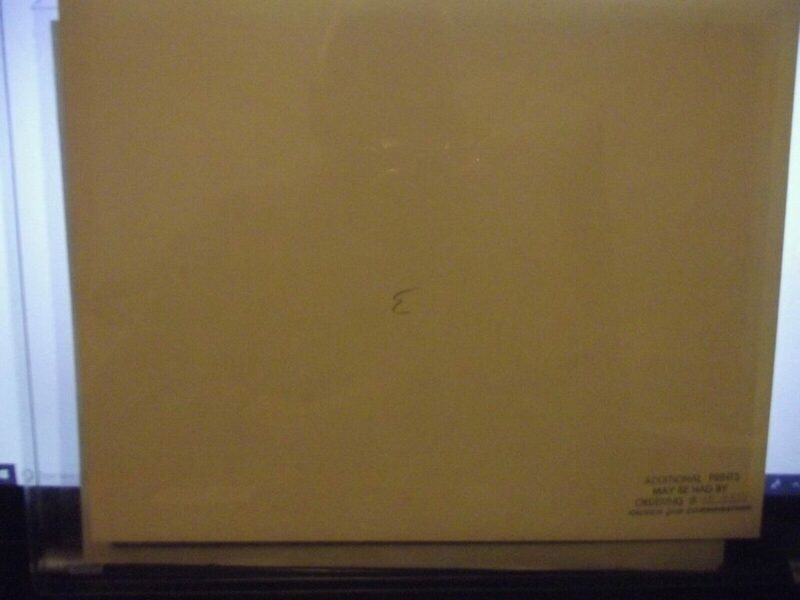 Mario shared it on Facebook.